Looking for a quick and easy pasta supper with a difference? Then check out this great pasta salad! 1. Cook the pasta in a large saucepan according to pack instructions. Drain and refresh under cold water until tortellini is cold. 2. 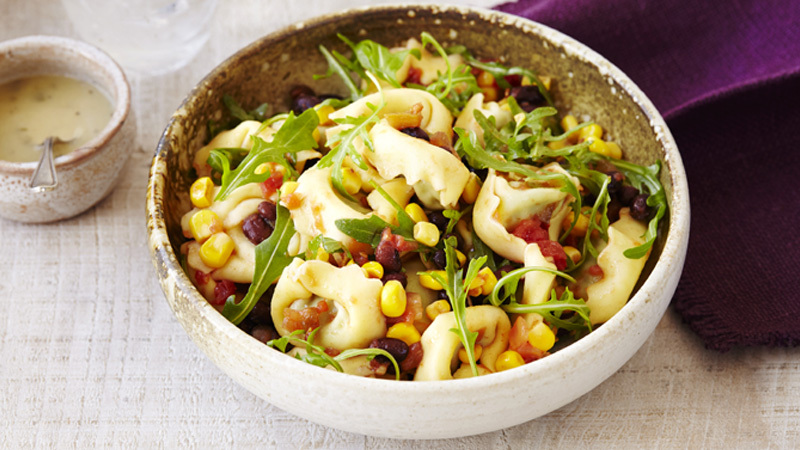 Place the tortellini, beans, sweetcorn and salsa in a bowl and toss gently to mix. Season to taste with salt and freshly ground black pepper. Gently toss the rocket leaves through the salad. 3. Serve the salad on 4 individual plates or shallow bowls and drizzle over the French dressing. Garnish with chopped coriander leaves. You can prepare this pasta salad a few hours in advance and chill until ready to serve on the salad leaves. Add some diced cooked chicken or turkey for an even more substantial meal.